One of my favorite Illustrators/Cartoonists is Charles M. Schulz. 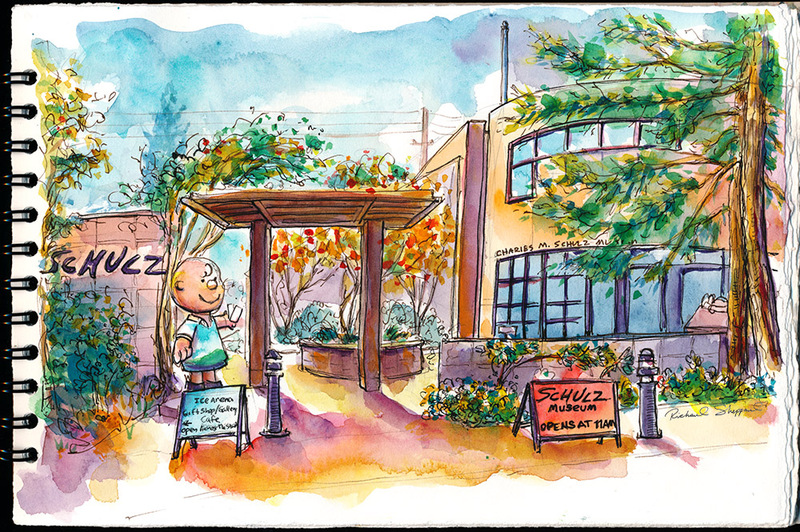 I learned months back that the Schulz Museum, normally closed on Tuesdays during the slower part of the year, would be open on Tuesday November 26th in observance of Schulz’s birthday. 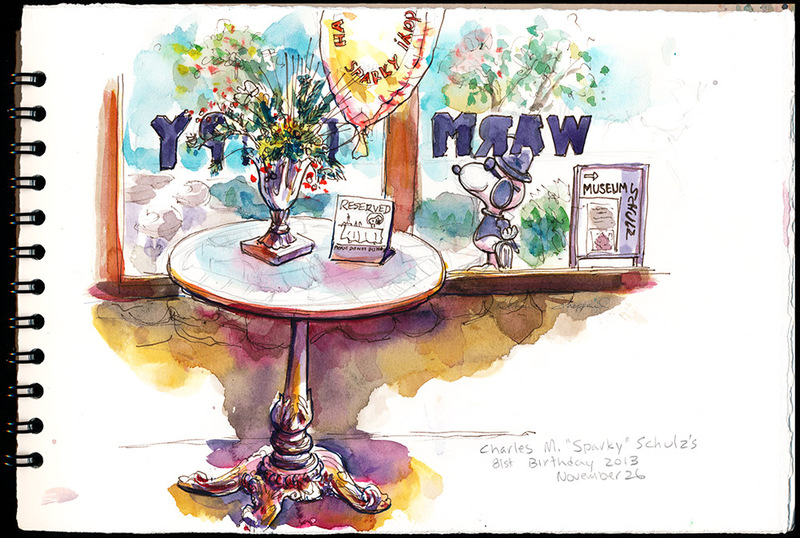 I joined the celebration that morning with a sketch of the museum in Santa Rosa. The current exhibit, entitled “Starry, Starry, Night,” was a joy, and it warmed my heart to see a grouping of comics featuring the lovable Peanuts characters pondering the universe. Schulz’s Redwood Empire Ice Arena, situated across the street, opened 28 April, 1969 with a grand opening ceremony starring Peggy Fleming and the Vince Guaraldi Trio. The building mimics an Alpine village with faithful reproductions of Swiss chalet facades and giant redwood trees that tower over the property. 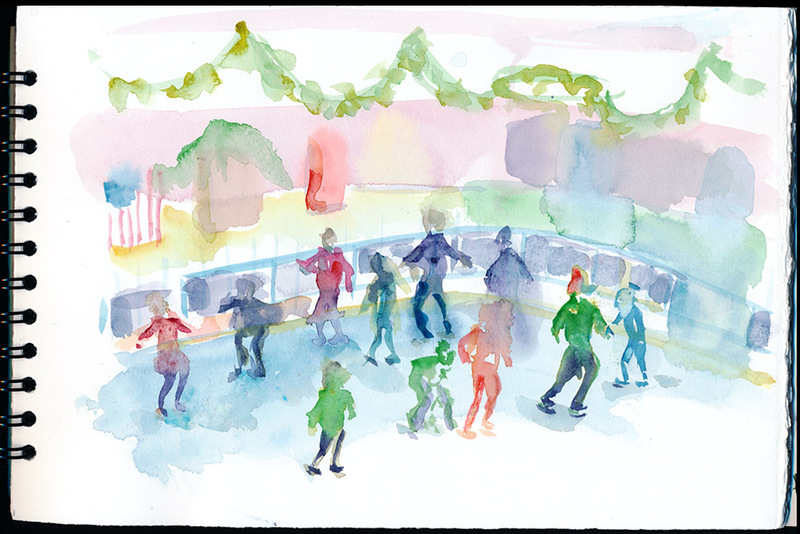 I bundled up and enjoyed the chilly temperatures while sketching the skaters. Their perpetual motion as the music thumped was mesmerizing but difficult to capture on paper. I’d like to return sometime soon and give it another try. The chilly temperature was a nice contrast to the abnormally warm weather we’ve been having this late in November and was a reminder that the Christmas holidays are fast approaching. Located in the same building as the ice skating rink, the Warm Puppy Cafe affords a panoramic view of the ice skaters and is the spot where Charles Schulz regularly ate breakfast and lunch. His table sits between the front door and the fireplace with a reserved sign and flowers honoring his memory. This entry was posted in Sketch outings. Bookmark the permalink. Nice work! I especially like the movement of the skaters. Thanks Bill! I had a hard time capturing the skaters but really enjoyed my time trying. I think over time I’d get better.